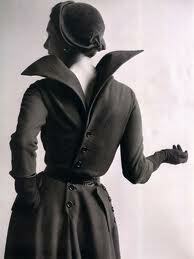 1950s fashion was massively shaped by Christian Dior’s “New Look” silhouette which was introduced in 1947. 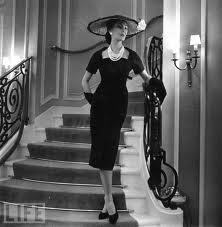 The New Look broke free from the wartime austerity look, women wanted to dress feminine and have a little luxury and they were given it. 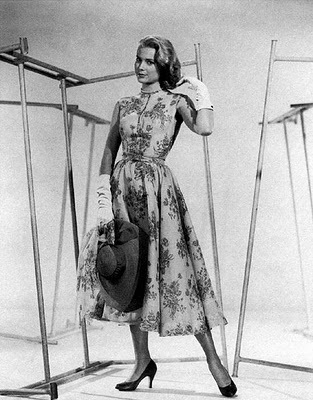 The cheap materials and skinny cuts of the 1940s were passed over for voluminous dresses made of beautiful plush materials. 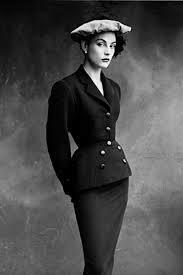 Instead of the leggy wartime look, the New Look emphasized the bust and hips, creating an hourglass figure. 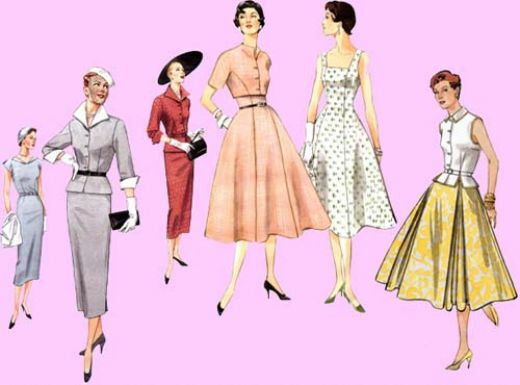 By the early 1950s this had evolved into swing skirts with petticoats and hourglass shaping dresses. 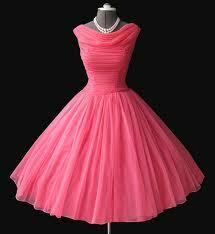 The hourglass silhouette and the full skirt were married together perfectly in the 1950s prom dress. 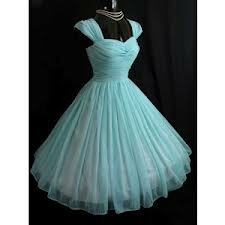 Whether it was sweet and simple, ornate or a sea of chiffon bigger than a doorway, the prom dress was the occasion dress. 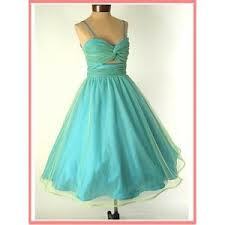 See our Prom-Perfect dress post. 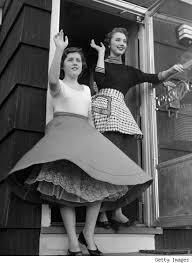 Prom dresses and petticoats were all puffed up thanks to the wonder that is the petticoat. 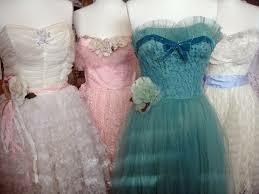 Petticoats are available in all lengths and colours. 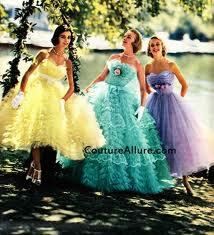 A bright or multicolored petticoat is the perfect accessory to jazz up a simple swing dress. 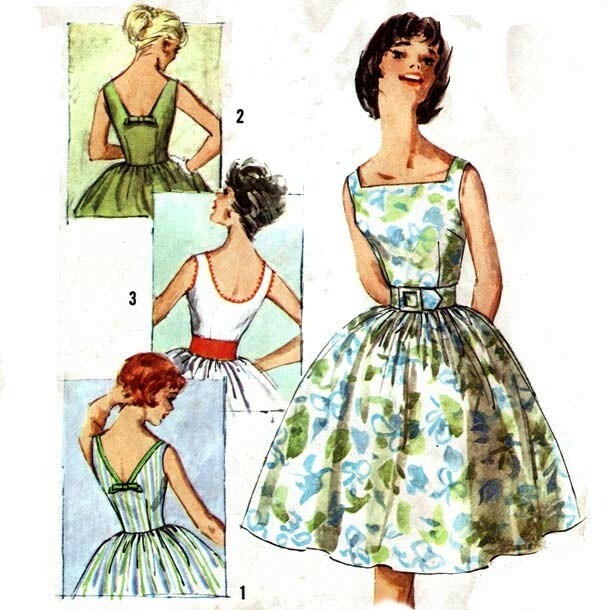 Variations of the prom dress had spagetti straps, small sleeves and halternecks. 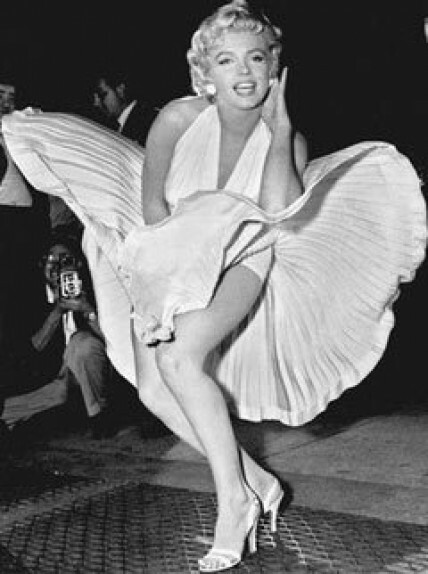 The Halterneck became increasingly popular after Marilyn’s famous “Seven-Year Itch scene”. 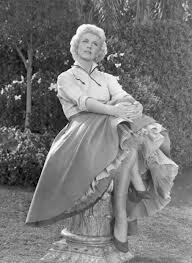 Nice teens dressed preppy in slacks and shirts or like Sandra Dee in swing, pencil or poodle skirts with pretty jumpers or twin sets and hair tied back in a pony tail. 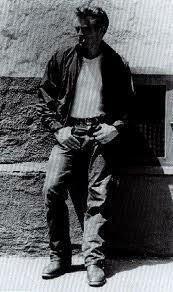 More rebellious teens would emulate their favourite stars like James Dean in Rebel Without A Cause. 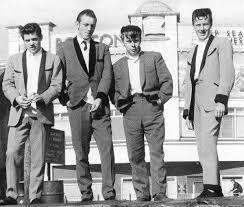 The rock ‘n’ roll brought rock and rockabilly fashion to life. 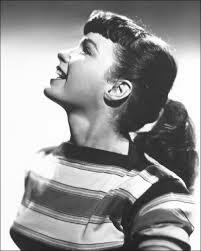 Helped along by B-Movie fashion and cult stars like Bettie Page, it was the look of the 1950s rebel. 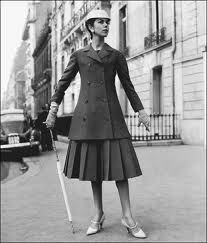 The Pencil skirt continued to be popular, with the waist nipped in further. 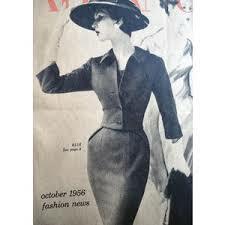 The pencil dress morphed into the Chanel-inspired sheath dress which nipped in at the waist and hugged the hips. 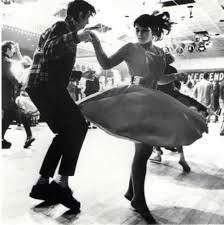 The more provocative wiggle dress was so tight it was given its name by the way women had to walk when they wore one. 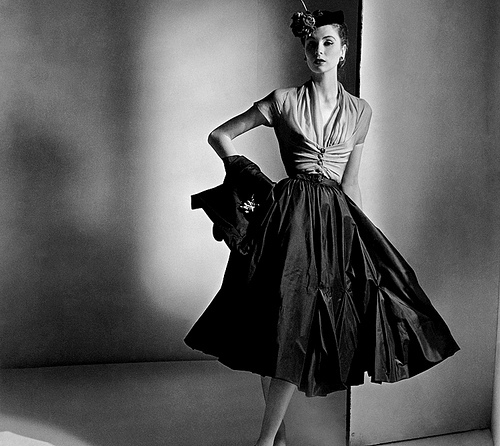 Dior’s 1947 New Look inspired most of the high fashion of the 1950s. 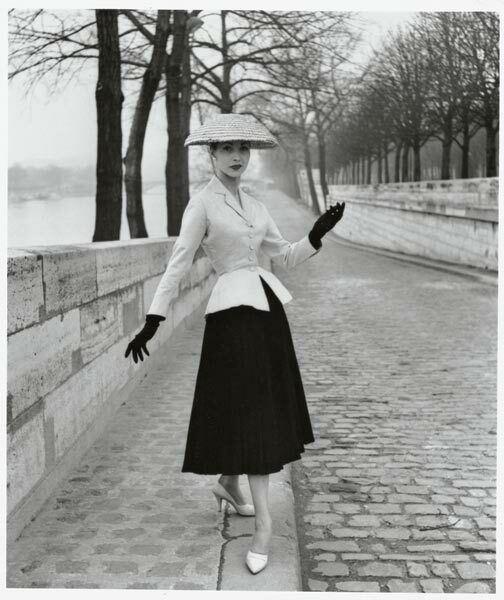 It featured a tailored, pleated jacket with a nipped waist and a peplum (a small skirt emphasizing a narrow waist and wide hips) that flared out into a mid-calf length, full skirt made up of several folds. 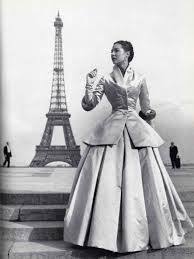 Throughout the 1950s Dior experimented with lots of different silhouttes, many still featuring the hourglass shape and nipped in waist. 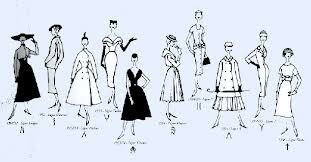 Towards the late 50s, designers started to stray from the structure of 1950s silhouettes opting for fashion that would free women from the restrictive hourglass silhouette. 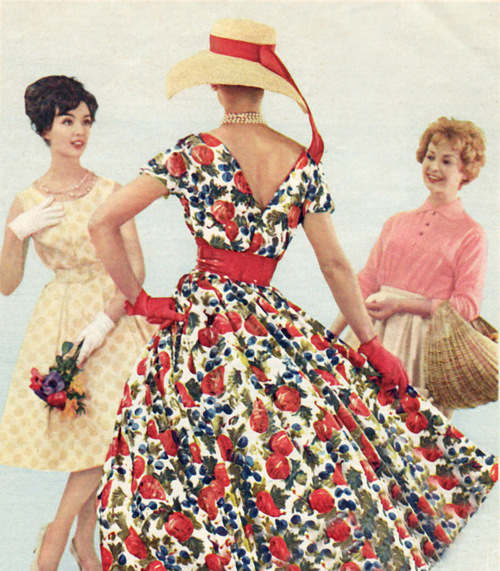 The waistless Sack dress was born and would be one of the inspirations for the corset-free dresses of the 1960s. 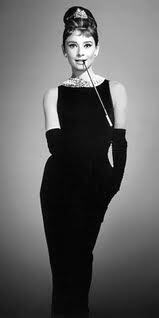 Breakfast at Tiffany’s famous Givenchy black dress also had its roots in the straight empire–line shift dress of the late 50s. 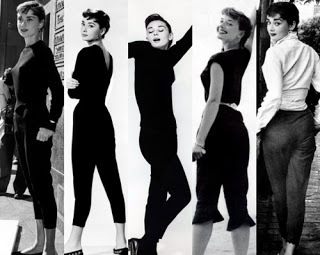 Slacks became popular amongst women but thanks to Audrey Heburn the more feminine pedal pushers and capri pants matched with ballet pumps became chic daywear. 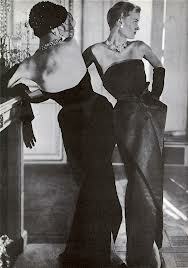 The 1950s was the era of Marilyn Monroe and the Hollywood Goddess, where stars and the women who emulated them dressed in dazzling luxury — opulent dresses in rich fabrics matched with jewels and polished hair and makeup. 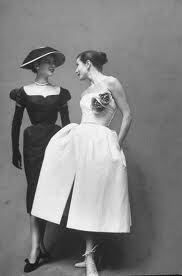 Without the restrictions of the 1940s, material and dresses came in bolder and brighter fabrics. 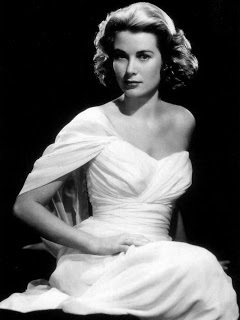 Florals and stripes were popular patterns and shimmering lame, chiffon and netting became popular party dress materials. 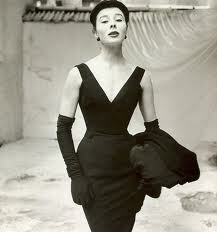 In the era of fashion excess, a beautiful dress was not enough. 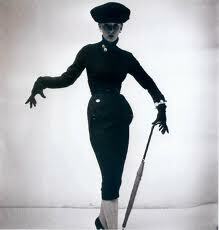 It was worn with a petticoat, lined tights, short gloves/long for evening and pearls or jewels. 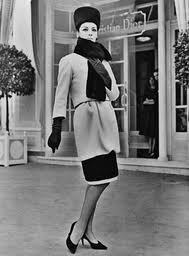 A hat and heels completed the look and ladies were kept warm in fur stoles and coats and trapeze /swing coats which were the only big enough to cover a large petticoat.